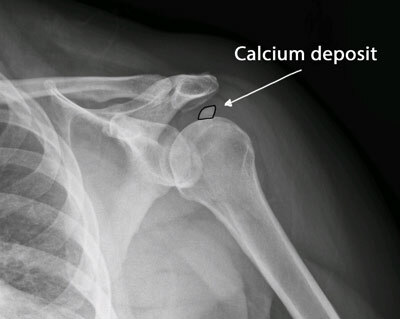 Calcific tendonitis refers to a build-up of calcium in the rotator cuff (calcific deposit). When calcium builds up in the tendon, it can cause a build up of pressure in the tendon, as well causing a chemical irritation. This leads to pain. The pain can be extremely intense. The cause of the calcium build up is unknown. Most commonly, it occurs without an injury. The pain in the shoulder is usually on the front and side of the shoulder. The pain is worse with reaching, lifting or sleeping on the affected shoulder. In severe cases, the pain is a constant ache that keeps people from sleeping at night. Your healthcare provider can make the diagnosis after taking a careful history, performing an exam of the shoulder and obtaining an xray. The xray will show the calcium deposit and confirm the diagnosis. The best treatment for the calcium deposit is an injection into and around the deposit. This will help the body resorb the calcium and help relieve the pain. Sometimes more than one injection is needed. An xray can be taken six weeks after the injection to find out if the calcium deposit is getting smaller. If the calcium does not go away with an injection and the pain is still present, then surgery can be done. An arthroscopic surgery can be performed to remove the calcium deposit. If the patient has no pain, but the calcium deposit is still present on the xray, no further treatment is needed. The calcium deposit will eventually go away and it will not cause further injury.